Wrapper born 4/5/12 is a Registered Paint Horse that is now a member of the family. He is very laid back, friends with Harry, and recently took his first dip in the Lake. Look for more updates as his training progresses. Well this is the most laid back horse I have ever played with.... he is scheduled to be gelded in Feb, and then we should see him sprout right up! He is still best buds with Harry and working his way into Sue's heart too. 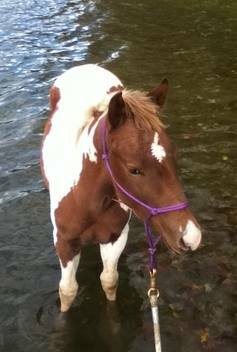 He has gone on three trail rides, and also worn a saddle. He was a gentleman for the Farrier too. Dentist is up next. Wrapper was gelded in May 2013, a trooper for the whole experience... included shots, and wolf teeth removal. 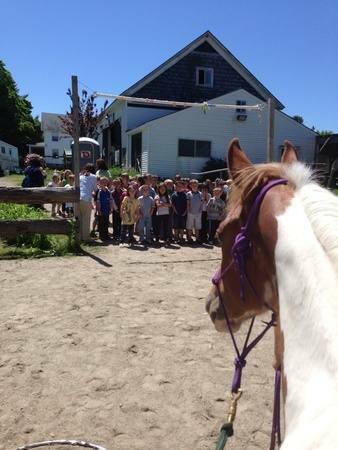 He was able to introduce 60 first graders to horses at the "Farm Days" for HLC. Wrapper felt so comfortable he was rolling around! Wrapper has continued to grow into a confident two year old. He is showing that he is ready to learn driving, and by summers end a possible light ride. Summer '14 has fast approached. Wrapper is able to go over all obstacles in the ring, down the road, do basic long lines, and mow the lawn. He has sprouted up, and begun to take on the look of a "horse" rather than a baby. I'll be doing more long line work with him this summer. 2016 Wrapper has taken to riding like a fish in water. He had an adventure at a different barn for two weeks, and was a super star. Spring 2017 Wrapper is being offered for sale with his brother. This is a wonderful opportunity to own a great matched team. Finish them off your way.